Our Natural Home is a depiction of Edmonton’s magnificent river valley. Every year thousands of residents and visitors take in this spectacular natural resource. 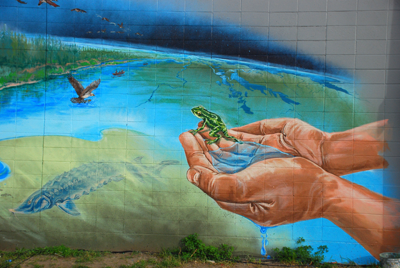 The mural illustrates the unique landscape, skyline and wildlife in the valley, highlighting the need to preserve and protect this incredible jewel in the heart of Edmonton.